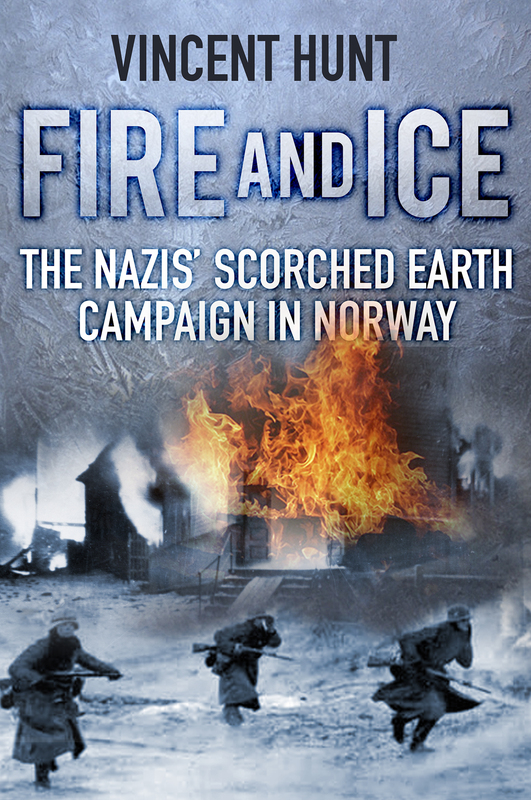 This Scorched Earth Stories blog has been quiet for a while because my book – ‘Fire and Ice: The Nazis’ Scorched Earth Campaign in Norway’ – about the wartime destruction of northern Norway by the Nazis has been in production. A team of proofreaders, editors and designers has been busy setting and adjusting everything, and that’s taken a while. I’ve been busy too, building a website to go with the book at www.vincenthunt.co.uk so you can see some of the great pictures from the time, thanks to the generosity of the people I have met along the way. ‘Fire and Ice’ is due for publication in late October/early November and so we’re getting ready for that. I would love to do some book launches in Norway, especially in the north, so I’m hoping there may be interest in that idea. I’ve written a piece about the book for The History Press blog, which I’ve included below. The book’s due to be published in America in February, so that too is very exciting, particularly as ‘Fire and Ice’ deals with the efforts of Norwegians in America to help with relief shipments during the German Occupation and also after the scorched earth destruction and evacuation. I’ll post more details as I have them. Northern Norway: rugged coastlines, beautiful nature, Midnight Sun. But a border with the Soviet Union and a direct road to Murmansk made it the perfect place for Nazi generals to launch a strategic punch against Stalin in June 1941’s invasion of the USSR. Despite a massive build-up of troops and weapons, the northern breakthrough didn’t happen. The Germans dug in, supplying the front through the Norwegian fishing town of Kirkenes which was turned into a fortress. The northern coast bristled with guns, anticipating an Allied attack. The German soldiers stationed across the north vastly outnumbered the civilian population – and living alongside each other, friendships developed; children were born. ‘Fire and Ice’ tells what happened when a three-year stalemate in the Arctic was broken in October 1944. The Red Army launched a huge counter-offensive to push the invaders out of the USSR: the German answer was a scorched earth retreat across northern Norway, destroying everything that might have been of use to their enemy: buildings, harbours, bridges – even the telephone lines. Fifty thousand civilians were evacuated just before winter set in. The Germans said they were saving them from Bolshevism – but some Norwegians had other ideas, barely surviving in caves and on remote islands. Somehow, this dramatic period has been forgotten outside northern Norway. The Nazis pulled 230,000 men and a mountain of supplies and munitions back to the mountains around Tromso, using Soviet POWs as slave labour to build gun positions and bunkers. Underfed, badly treated and working in sub zero temperatures with little protection from the elements, many succumbed to starvation and brutal treatment – or were literally worked to death. The Russians liberated Kirkenes in October 1944 but the north of Norway was reduced to ashes. Norwegian troops returned to take control of the liberated areas but found themselves running rescue and relief operations. When the war ended in May 1945 the full scale of the destruction was clear… everything had been destroyed. Some families defied government advice and the lack of shelter to go back and begin rebuilding their lives. Women who had been too friendly with German servicemen now faced the wrath of their neighbours. The Soviet prisoners were sent home to a country which no longer wanted them. Northern Norway had paid a heavy price for its brief strategic importance in Hitler’s military ambitions – and seventy years later, the people whose roots are in the north are still counting the cost of the Nazi scorched earth retreat. ‘Fire and Ice’ is Vincent Hunt’s first book for The History Press. An award-winning BBC documentary journalist for many years, he travels across the Arctic north of Norway, meeting people who reveal dark wartime secrets, stories of suffering, pain and brutality and an ongoing rift between Oslo and its citizens in the north. This entry was posted in 20th Century, Arctic Circle, Finnmark, Finnmarken, German submarines, Germany, Hammerfest, history, Hitler, Honningsvag, Nazi, Norway, prisoners of war, Scorched Earth, Second World War, Soviet Union, Wideroe airlines. Bookmark the permalink.